After the Trump-Kim summit was announced on March 9, Bolton made a tactical adjustment in his public stance toward talks with Kim to avoid an open conflict with Trump. He started suggesting in interviews that Trump had cleverly “foiled” Kim’s plan for long, drawn-out talks by accepting the proposal for a summit meeting. But he also urged Trump to assume a stance that would guarantee the meeting would fail. And in a second interview with Fox that day, Bolton suggested that Trump demand that Kim identify the ports and airfields to be used to “dismantle your nuclear program and put it at Oak Ridge, Tennessee, where Libya’s nuclear program lives.” Bolton’s invocation of the Libyan example of giving up a nuclear weapons program was an ostentatious way of conveying his intention to keep open the option of using force to overthrow Kim’s regime. Albright nevertheless implied that nuclear-grade graphite is produced and traded covertly. In fact, it is sold online by trading companies such as Alibaba like any other industrial item. 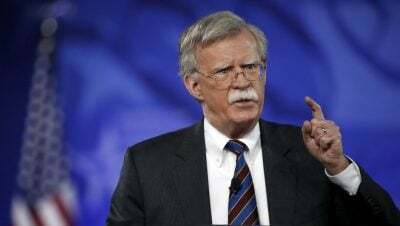 Bolton’s hopes of keeping the option of U.S. war on Iran flopped in 2004, but he still believes in a first strike against North Korea, as he urged in an op-ed in late February. And he can be expected to continue to use his position in the White House to try to keep that option open as he did with Iran in 2004, in part by covert leaks of information to allies outside the government.